An easy and quick classic Chicken Marsala recipe. Breaded and pan-fried chicken cutlets in a creamy and rich Marsala wine sauce and loaded with mushrooms. This Italian-American dish is ready in under 30-minutes and will become a family favorite. Serve this Chicken Marsala with a side of mashed potatoes and homemade bread with a herb dipping sauce. PIN recipe HERE! Follow VALENTINA’S CORNER for more cooking inspiration! Chicken Marsala is a traditional Italian dish that has become quite popular in most American and Italian restaurants. Chicken cutlets pan-fried until crispy loaded with mushrooms in a creamy Marsala wine sauce. This dish is so easy to make at home at a fraction of the cost. Winner! Either use chicken strips or cut chicken breasts into thin cutlets by slicing the breast in half horizontally. Slice mushrooms into thick slices and sauté with the butter and garlic. Using the same pan, add ingredients for the Marsala wine sauce, once it thickens return the chicken back to the pan and simmer. Coat the chicken generously with the Marsala wine sauce. Dinner is ready! Easy, peasy under 30-minute meal, the whole family will love. This recipe makes a lot of the Marsala wine sauce. It’s perfect to pour over your pasta or mashed potatoes as a gravy. Use a dry Marsala wine, a sweet wine will not taste right. 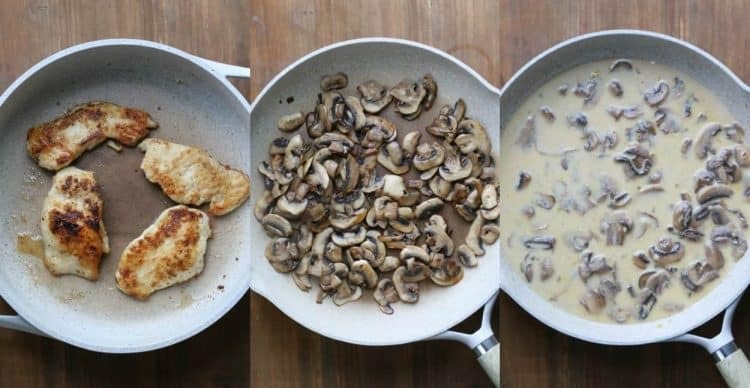 Once the mushrooms are sautéed with the garlic and butter, add Marsala wine with chicken broth and allow the sauce to simmer several minutes before adding the heavy whipping cream. The sauce should simmer for several minutes until it thickens. Once the chicken cutlets are added back into the sauce, the chicken breading will thicken the sauce even more. For a lighter sauce, use half and half in place of heavy whipping cream. However, the sauce will not be at thick if using half and half. What side to serve with this recipe? Pasta is a classic side to serve with the recipe. Angel hair is our favorite pasta to use though spaghetti, linguine or even fettuccine may be used if that’s your personal preference. If you don’t like pasta, serve the dish with mashed potatoes or zucchini zoodles. Pour the extra sauce over your side for added flavors and creaminess. What kind of wine can I use for Chicken Marsala? I’ve experimented with many Marsala wines and most work wonderful in the recipe. You don’t need to purchase a really expensive wine. Chicken Parmesan Recipe– The best chicken parmesan recipe! Chicken Scampi Recipe– Simple chicken scampi copycat recipe. Creamy Chicken Shrimp Scampi Recipe– Chicken and shrimp in a creamy sauce. 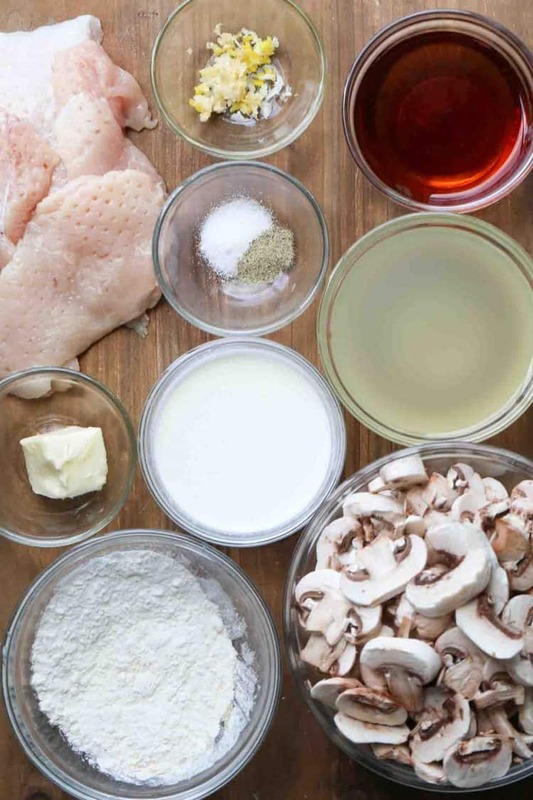 An easy and quick classic Chicken Marsala recipe. Breaded and pan-fried chicken cutlets in a creamy and rich Marsala wine sauce and loaded with mushrooms. Cut the chicken breast in half lengthwise. Lightly beat chicken until even in thickness. In a bowl, combine the ingredients for the breading. Generously coat the chicken cutlets in the chicken breading. In a skillet, heat 3 Tbsp oil. Once hot, cook the chicken until fully cooked flipping halfway, cook 2-3 minutes per side. Remove from the skillet and set aside. Using the same pan, saute the mushrooms with 1 tsp oil in until fully cooked. Add 2 Tbsp butter and garlic and saute for another minute. Add flour and quickly stir. Add the wine, broth, salt, pepper and simmer about 2 minutes, until sauce thickens. Add in the heavy whipping cream, simmer for another minute. Add the chicken back into the pan and cover with the mushrooms Marsala wine. Cook until chicken is hot. So delicious and perfectly seasoned! I made this dish once before, and then had to make it again because every time I saw mushrooms at the store, I would crave it. This makes me not want to try chicken Marsala from restaurants because I don’t want to be disappointment in comparison to this tasty meal. This makes me smile real big, Yuliya. That’s awesome (and for a fraction of the price). Thanks for being a part of our online family. This looks easy, delicious, and flavorful! I will most definitely be making this tomorrow for dinner! Jessica, I hope you love the Marsala. And.. it really is so delicious and easy to make. My husband LOVED this chicken. I wasn’t too much of a fan (probably because of the wine taste), but I still consider it a success. Thank you! Thanks so much for the feedback, Lilly! So glad to hear the Mr. loved the Chicken Marsala, makes me smile. If you are not used to cooking with wine, it definitely could be the wine. Try adding less next time :)! Thanks for visiting our online home. Nothing better than homemade Chicken Marsala with a side of mashed potatoes. You’re going to love it, Inna! Do you dry or sweet Marsala? Hi, Ruth! You can use either dry or sweet Marsala. Sweet marsala tends to work a little better as it has a deeper taste. But if dry is all you have, that will work just fine. I hope you love the recipe as much as we do. Thanks for visiting our online home. I made Chicken Marsala for dinner tonight and my whole family loved it. Definitely I will make this recipe again. Thank you for sharing this recipe with us. why cant i pin your recipes? i would like to just pin the first picture, not the whole set. how do i do that? Thanks so much for visiting our online home.